A few years back, I used to come across folks who would go to Thailand two, sometimes three or more times a year, and I'll be honest when I say I used to judge them. It's not that I didn't enjoy my initial visit to Bangkok- in fact I loved it- but my travel mantra had always been that with so much to see in the world, why would anyone bother going to the same place repeatedly? Fast forward to last year and I found myself (willingly) going to Thailand twice in the span of a year, with no shame or regrets. In my defense, my last vacation plan in the late fall/early winter didn't start off with Thailand as the destination at all but when it all just fell together naturally to settle on the land of smiles, I went with it and had no qualms. I walked around, stuff my face, rested up, stuffed my face some more, and did everything in my power to not think about the bitter winter that awaited me back in Seoul. What is it about Thailand that draws me back so repeatedly? I'm not so certain myself. But when I put all the duration I've spent in Thailand over my lifetime, I realize it's fourth in the ranking of countries I've spent the most time in (after the US, Korea, and the UK) so, at the very least, there's a special connection I've established there, and in particular with Bangkok. So without further ado, here's part III of my Bangkok eats series from November, 2014 (a continuation of the series which includes part I as well as part II from my earlier visit in March of the same year and a post about Don Mueang Airport and its food court). I don't think I can make this one as detailed as the previous BKK installments as it's just so much and, in fact, I'm going to have to wrap Bangkok up with a fourth installment- not to mention separate posts for Chiang Mai and Phuket. But for a broad overview of some of the places I ate and things I did, here's part III! As always, my mantra is try to be as local as possible and, with the help of some of my stellar Thai friends, here's some of the places we hit up, eats and drinks we had, and unforgettable memories. Just in case I decided to change plans, I didn't really tell my Bangkok friends I'd be coming until last minute. Given how everyone are busy bodies, I was able to get some time in on my first full day in Bangkok with my buddy Shaun before he jetted off for some travels during my time there. He's a foodie and cook so I can always count on him for some excellent eats and this was no exception. As one of Thai cuisine's iconic dishes, somtum itself has long been more of an everyday dish until recently. Many eateries, just like Somtum Der, are taking somtum beyond the generally mainstream, sweeter Bangkok flavors and here, the flavors lean Issan (the northeastern part of Thailand) and closer to the original flavors of sumtum. I'm told Issan restaurants and eateries, even in Bangkok, are often more homely and rustic in appearance and style but Somtum Der is definitely modern and spacious and feels more akin to a bistro. It's been steadily growing in popularity and recognition to the point it's even opened a branch in New York! The magic happens in the open kitchen where many of the ingredients are sourced from the owner's home regions in the northwest. As the restaurant name suggests, the somtums are some of the spot's best dishes with a long range of somtum made Issan-style and pounded fresh to order. Unlike the sweeter palates of Bangkok, the flavors are fiercer and stronger which Somtum Der doesn't compromise with the exception of their fish sauce which is pasteurized here for a general appeal (which is not the case in the northeast and more pungent). I always leave the ordering when dining in the more-than-trustworthy hands of Mr. Shaun and he went ahead ordering a delicious storm of food that smacked me straight in the taste buds to let me know I was truly back in Thailand. Grilled pork neck. A very Issan dish that was grilled perfectly and so juicy. Somtums... the first is the more generic one while the second one has fish cakes and sausages(?). Definitely less sweet but not lacking in any flavors! And you know I love somtum to death so I was reaching for both these somtums quite often. Deep fried spicy mince pork. Laab itself is another iconic dish in Issan cuisine and here the take is a sinfully deep fried version that's perfectly crisp on the outside and tender inside. The fried chicken also had the perfect crust to lock in the moist thigh meat inside. What really took it to the next level though, was the sauce accompanying it. Spicy tub tim fish salad. Those herbs pack quite a punch! Spicy grilled beef. So tender and well grilled! I didn't mind eating it even without the delicious side that came with it. As usual, it was another feast for me with Shaun. Thanks again, buddy! PS- Excuse the odd perm hair I tried out last fall which will continue to pop up in my Thailand pictures. Sigh. I then returned to meet up with my buddy Pop (whose house I was crashing at yet again) where we had a lazy Saturday chilling at a cafe, getting massages after, and catching up. Perfect weekend! As the sun set, Pop and I headed over to Ari to be reunited with another dear friend, the flawless Ms. Noo, as well as to meet her friend Ppong. Why all the way out in Ari? Well the plan was to have dinner at the locally trending Summer Street where plates of seafood are prepped and brought to the outdoor tables for grilling. 2. Grilling outdoors in Bangkok heat (even if it's winter) didn't sound that appealing. But it definitely was a fun and pretty atmosphere and definitely one of THE places to be apparently for the locals on a Saturday night. Luckily, Noo knew a spot nearby which we relocated to after a 3-5 minute walk. Baan Pheung Chom certainly doesn't lose out in the atmosphere department from Summer Street and is in many ways more charming. The old Thai house belonging to the owner's grandmother was renovated into this restaurant and the property has a large yard filled with trees, a pond in the back, and lots of interesting antiques and decoration from all over the world. It was jam packed both inside and out though we were lucky to score a table inside within just a few minutes. Baan Pheung Chom exudes a homely yet rustic grace to it such as in the old fashioned beer mugs that I was told was just like the ones used to serve beer at home for Thais. The prices are extremely low, servers are friendly and attentive, and you have the feeling like you're almost having a meal at someone's home (which is technically true). Some standouts included the stir-fried kajong flowers with shrimp (dok kajong pad kung) which was certainly unusual and addictive. The sauce on the side is cloyingly sweet which pairs well with the flowers but frankly, I preferred the crunchy bits on their own. My regular favorite stir fried greens. I think this is pad pak boong? Another representative dish here is the "three smells" stir fry noodles (woon sen pad saam men). This is a dish that really packs a wallop (thrice, in fact) in flavor from the garlic, stinky bean, and sharp cha-om (an herby vegetable with quite the strong flavor). It's an intriguing mesh of flavors that come in waves from the bitter to sharp and pungent but I still found enjoyable. If stronger flavors aren't your forte and/or if you're still adjusting to the bolder flavors of Thai cuisine though, you may want to save this dish until you build some more tolerance. Otherwise, delicious! Though, definitely not a dish to be eaten on a date hehe. I've tried an extensive amount of Thai curries now with all sorts of ingredients but the red salmon curry with lotus and bamboo bits was certainly different take for me and a first. I was initially concerned thinking the red curry would drown out the oilier flavors of the salmon but they surprisingly paired well while the crunchy bots of lotus roots and bamboo serving as a nice contrast in texture. With just a bit of spice to it, it was lovely spooned atop the flaky rice. The wing bean salad tasted like most other wing bean salads I've had. I've mentioned before this is one of the rare Thai dishes that I don't quite have an affinity for but very fresh and obviously made to order! It wouldn't be a full Thai meal without dessert and I was soon whisked away to get some street side sweets at Pang Ya Ari. The roadside stall has a few tables around and patrons can either make orders to go or sit down and enjoy. Judging by the pace and energy level, it was definitely a popular joint. An assortment of drinks, sweets, and desserts are offered including their famed milk and Thai iced teas. Their thick slices of bread can be topped with riches such as butter, sugar, condensed milk, pandan leaves concentrate and more. And just off those ingredients alone, you can tell that it certainly can't taste bad, right? :P Here's one with butter and sugar and one with condensed milk and pandan leaves concentrate. Don't we just look happy? Our last stop for the night was at the quaint Fatbird. The vintage meets hipster decor and vibes is evident upon entry but, like the glowing lights, the atmosphere warms as time passes. We were too stuffed to enjoy any of the food (which I'm told is pretty good) but taking in a few Singha bottles in the cozy spot and catching up was just the thing to cap a pretty memorable first night back in Bangkok. One of Bangkok's most famed restaurants for home-style Thai, I'm surprised it took me this long to come here but I'm ever so grateful to Pop for taking us here as it has become one of my favorite spots in Bangkok. The flagship location is in the owner's original childhood home but is not so easy to find as it takes a bit of walking from the nearest Thonglor BTS. But they do a pickup service in their own tuktuk from the entrance of Soi 34 it seems if you call ahead. They also have five other locations scattered about if the one off Sukhumvit isn't close to you. The first thing that strikes you about the flagship restaurant is its whimsical and modern decor. The check board floors, colorful chairs, and light fixtures gives it a modern, swanky hotel feel which could come off as artificial if it weren't for the enormous glass walls that lets in natural sunlight. The modern redesign comes from the owner's daughter and I have to say she did a swell job without making the place come off as tacky. Drinks are fresh and made to order with real fruit in the slushies. Crispy fish, crunchy cashew and lots and lots of lemongrass. So good. What is it about lemongrass that pairs so well with fish? Fried fish cake rolls with a sweet, cucumber sauce. Would be boring on its own but the bright and sweet flavors of the sauce is what elevates the dish for sure. Look at how perfectly that's grilled! Crab fried rice. So flaky and delish. Crab roe and crab meat dip with fresh vegetables. I've fallen in love with these nam phrik style crudites and dipping platters in Thai cuisine. This version has a lovely creamy dimension to it from the crab roe and meat. Stuffed to the max but couldn't resist getting dessert. Taro balls and young coconut in coconut milk. Part chewy, crunchy, and tamely sweet. A perfect way to cap off a rich meal. And then we took the restaurant's tuktuk back. :) Thanks for the rec, Pop! 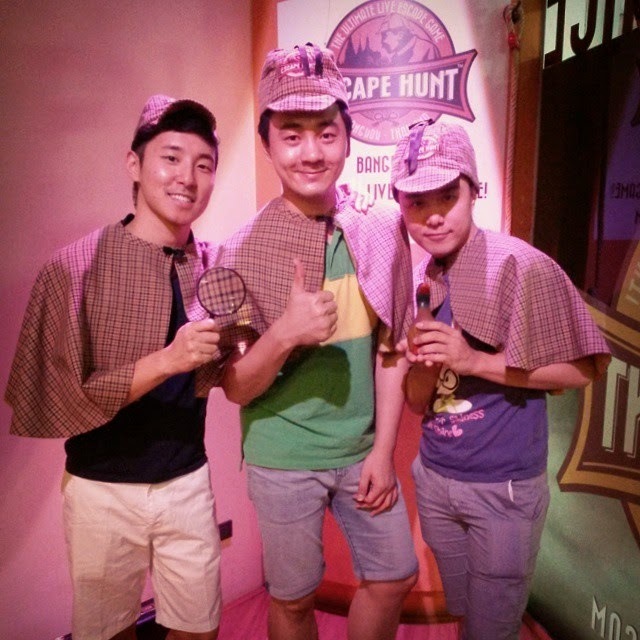 On a side note, we decided late minute to take part in one of those trending mystery rooms and specifically, the Escape Hunt in Bangkok. For those who don't know, you and your friends choose one of several themed mysteries to solve and escape the room using the clues around you. The catch is that you're given only an hour to solve the mystery and also find a way to escape the room. We chose a murder mystery one which proved a lot of fun. There's a lot of red herrings scattered about to throw you off and forces you to work together. All in all, it was a lot of fun and enjoyable experience. Though certainly not unique to Bangkok, for a repeated visitor to the city, it was a nice little side thing to do. Prices aren't exactly cheap and I don't think I'd be doing it again but the prices do drop the more people you have in your group. If your group is large enough, you can even split into two rooms and compete against each other to see who has the fastest time. Afterwards, they serve you tea, take pictures of you in Sherlock Holmes attire, and give you certificates. Gimmicky but fun. Thonburi is generally more associated with Wat Arun and not much else but the area has been burgeoned in recent years with a growing number of hip spots including the Jam Factory compound. In addition to a cool gallery, shop, and whatnot, the compound houses the definitely hi so, highbrow restaurant, Never Ending Summer. Brought forth by famed Thai architect Duangrit Bunnag and his partner, Naree Boonyakiat, The Never Ending Summer is a culinary homage of sorts to the upper class daily Bangkokian eats they used to enjoy as children. Outside, the building is housed in an old warehouse which doesn't look like much but the inside is a spacious, airy, open kitchen style restaurant that's modern but still manages to bring about some homely vibes. The main chefs of the restaurant were apparently made to study old cookbooks from Bangkok's high society ladies and combines old favorites and rare treats. Watermelon with 'dry' dressing of sugar, dried fish, deep-fried shallots. I'm told it's an old classic and was certainly unique. I found it enjoyable and the savory fish and shallot bits paired well with the fruit but it could have cut down on the sugar as the watermelon was plenty sweet on its own. Closeup of the dry dressing. Nam phrik ka pi included plenty of fresh vegetables and greens, grilled fish, egg omelette, etc. The nam phrik was very fresh and not overpowering but I thought could be a little bolder and less sweet. Kang liang goong sod with squash, baby corn, shrimp, greens, and such. I enjoyed this soup a lot more than I thought it would. I haven't had a lot of non-spicy soups in Thai cuisine and this one had plenty the flavorful broth that still let the gentle flavors of the ingredients come through. Pad woon sen. I liked it wasn't oily like many places but it was rather unexciting in taste. All in all, I had a good meal and enjoyed the vibes and chill atmosphere of the place. I'm not certain the food quite matches the level of the restaurant's feel and look and I certainly wasn't blown away by any particular dish. Still, it's worth a visit if you're already out in the Thonburi area and I certainly would love to check out more of the Jam Factory the next time I'm in town. We capped off the night by heading over to the historic neighborhood of Rattanakosin district in the old town of Bangkok to enjoy cocktails at Eagle's Nest, a rooftop bar right off the Chao Phraya river. You're spoiled for choice in rooftop bars in Bangkok but the Eagle's nest is well worth a visit for its spectacular views of not only Wat Arun but Wat Pho and even Wat Phra Kaew. Interestingly, the bar itself is located on the rooftop of a hotel called Sala Arun. There's no direct access to the rooftop so you have to enter the hotel and then climb the stairs to the top (no elevator). I should mention that the rooftop is also on something like the 4th or 5th floor and the hotel's floor halls don't seem to turn on their AC so the climb can be rather tedious for those who aren't in the best of shape. It doesn't help that the bar's restroom is only located on the first floor so anytime you need to take a wizz, you'll have to down to the lobby and then climb the stairs all over again. The last set of stairs is particularly memorable as it's one of those small, spiral kind which I haven't seen since my days in Europe. And here's a bit of the Grand Palace and Wat Phra Kaew on the other side of the bar. The bar itself has a warm, friendly vibe and gets especially popular as the sun begins to set. The tables closest to the river are especially popular. Drinks are pretty extensive from classic cocktails to variations and all moderately priced. Being an outdoor venue, it's definitely warm but the gentle breezes along the river banks definitely helps. And off I went the next day to Phuket and then Chiang Mai later on with some back and forth to Bangkok in between. Stay tuned for part four of the Bangkok eats installment as well as posts for Phuket and Chiang Mai!